Wardrobe Lift with Elevating Mechanism or Garment Lifts. 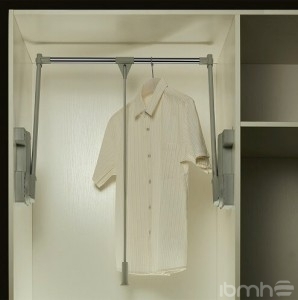 Featured product: Wardrobe Lift with Elevating Mechanism or Garment Lifts. Today we present a spectacular pull out clothes hanger to make accessible in a very comfortable way all clothes from your closet: the wardrobe rail. This hardware is also known as extending wardrobe rail, garment lifts, pull-out wardrobe rail, and wardrobe lift. It belongs to the category of coat racks, also known as pull-out clothes hanger, wardrobe rails and wardrobe lift with elevating mechanism. 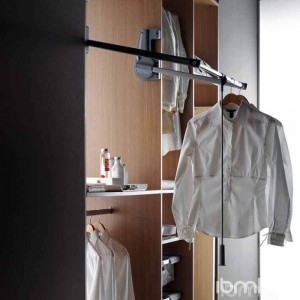 This accessory allows a total use of the space in wardrobes or closets in which it is installed, thanks to its use it is possible to hang the garments in the higher altitudes reaching up to the ceiling. 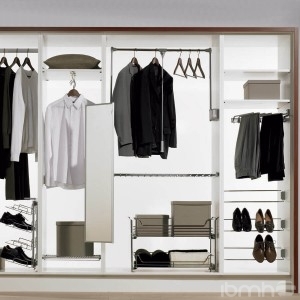 It provides an easy and comfortable access to the clothes, equipping cabinets of different sizes. The maximum load capacity of this hardware is 12Kg, 15Kg, or 18Kg, so when purchasing it you may define exactly the force required holding for the load. This wardrobe lift has a hydraulic lift system, which provides an excellent softness during its process of closing and opening. Once the pull-out clothes hanger is completely down, it remains in that position while any garment is selected or placed; finally simply exercising one slight manual pressure up, the hydraulic system helps go up and gently place in its highest position. At IBMH we have localized Chinese factories that manufacture directly for companies like HAFELE, HETTICH, INDAUX, etc., so we can say that the quality of wardrobe lifts with elevating mechanism that you can import from China are of a very high quality and absolutely proven.